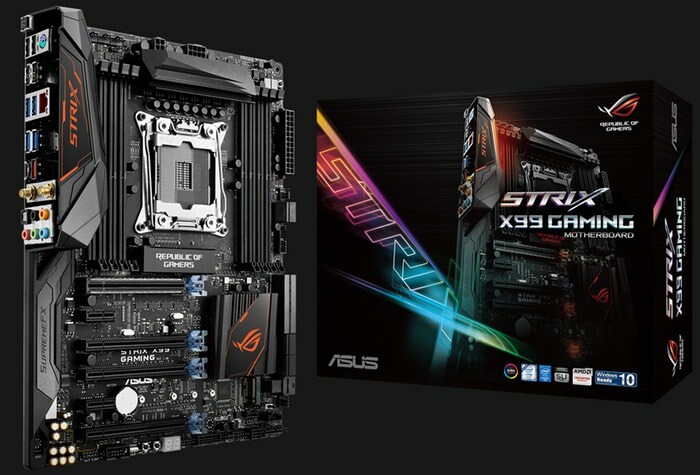 ASUS as this week announced four new additions to its range of premium motherboards with the launch of the ASUS Signature X99-Deluxe II, X99-A II and X99-E, and ROG Strix X99 Gaming as new additions to the lineup of ROG Strix series motherboards. Joe Hsieh, ASUS Corporate Vice President and General Manager of Motherboard Business Unit explains more about the design of the latest motherboards to be unveil by ASUS. Next-generation connectivity is also a major theme of the refreshed X99 Signature series, with up to dual U.2 and M.2 slots to tap into 32Gbps of PCIe bandwidth, 3×3 802.11ac Wi-Fi, and USB 3.1 Type-A and reversible Type-C. X99-Deluxe II also includes ASUS ThunderboltEX 3, a quick-to-fit expansion card for blistering transfer speeds of up to 40Gbps. ROG Strix is the newest recruit into the Republic of Gamers – and ROG Strix X99 Gaming is the first ROG Strix motherboard. ROG Strix X99 Gaming delivers premier performance, innovation, and confident dynamism to release the gamer’s inner rebel, with a bold design and bright, customizable colors that channels the spirit of fierce individualism. For more details and full specifications on all four motherboards unveiled by ASUS this week jump over to the official press release via the link below.